Daniel Cormier is standing by his teammate Khabib Nurmagomedov, who threatened to leave the UFC if they fire Zubaira Tukhugov for his role in the melee that unfolded at the conclusion of UFC 229 this past Saturday night. The situation escalated on Thursday when Nurmagomedov released a lengthy statement aimed at the UFC after Tukhogov was pulled from his upcoming fight against Artem Lobov at the UFC Fight Night card in Moncton, New Brunswick, Canada. Nurmagomedov said he would quit the UFC if Tukhugov was released, which is what UFC president Dana White promised would happen after he got into a brawl with Conor McGregor inside the cage during the melee in Las Vegas. Tukhugov was one of three people who engaged in the melee inside the Octagon with McGregor after Nurmagomedov leapt over the cage in an attempt to attack the Irishman’s teammate Dillon Danis, who was part of his corner for the fight. Now Cormier is defending Nurmagomedov’s ultimatum and asking that the UFC keep Tukhugov on the roster. Cormier points to the fact that no one was punished by the UFC after McGregor led an assault on a bus filled with fighters in an attempt to go after Nurmagomedov back in April. Lobov was pulled from his fight at UFC 223 a few days later after he was involved in the group of people McGregor had with him during the assault but he faced no further retribution from the organization. Lobov is also expected to face a replacement opponent on the upcoming UFC card in Moncton, although Tukhugov’s standing with the promotion has not been determined as of yet. Obviously, Cormier is showing loyalty to his friend and teammate but there’s no word yet on whether or not Tukhugov will face further sanctions for his involvement in the melee last Saturday night. 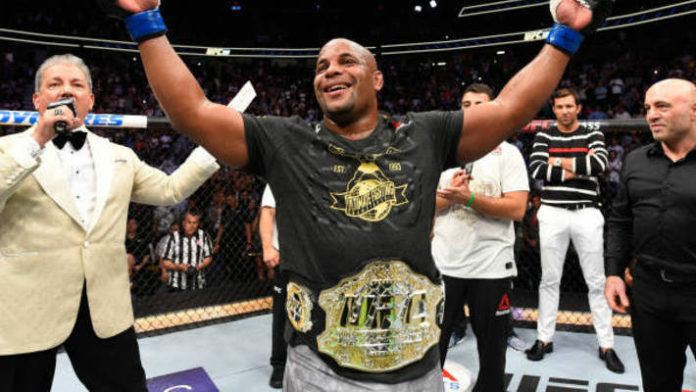 Is Daniel Cormier correct about his assessment of the situation with Khabib Nurmagomedov defending his teammate? Sound off in the comments and let us know!